1. Heat 1 tbsp oil in a frying pan over a medium-high heat. Add the onions and fry for 5 minutes until golden. Add the garlic, cook for another minute, then add the tomatoes and cook for 3–4 minutes until starting to colour and soften. Stir in the lentils and vinegar, season, then heat until warmed through. 2. Place a griddle pan over a medium-high heat and cook the halloumi for 1–2 minutes on each side. 3. 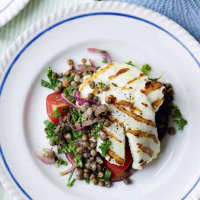 Stir the herbs into the lentils and serve with the halloumi, drizzling over the remaining olive oil and the lemon juice. This recipe was first published in Wed Apr 25 13:50:51 BST 2012.